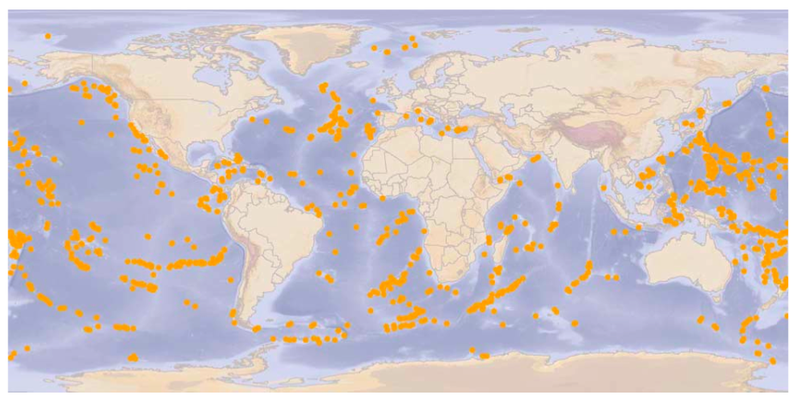 What makes seamounts optimal for fisheries? Global distribution and sizes of deep-sea fisheries. Sustainability and management of deep-sea fisheries. Deep-sea fisheries are defined by the International Council for Exploration of the Sea (ICES) as fisheries in waters deeper than 400-500 meters . In recent years, with rising global population and increased technology, near-shore fisheries have been under tremendous amounts of pressure. Many of these fisheries have collapsed, and people began to search deeper into our oceans to find untapped resources of fish. Deep-sea fisheries appeared to be the solution to this problem, with a high abundance of fish located around seamounts, which are underwater mountains. Today, the majority of deep-sea fisheries are located on seamounts, but because seamounts can be far off the continental shelf, and difficult to locate, deep-sea fisheries must extract enough fish to compensate for the costs of these challenging conditions. Seamounts form unique ecosystems due to ocean current systems that bring in an abundance of phytoplankton and other nutrients, making it an optimal place for organisms to live. Because of the topography of seamounts, current systems play a major role in the types of organisms that inhabit seamounts. For the most part, deep-sea currents tend to be weak (a few centimeters per second). When these currents hit a seamount, the water moves up across the slope and descends when it reaches the other side. As the current moves along and around the slope it speeds up, creating counter-rotating vortices. If the initial current is a bit stronger, eddies are formed . The circular movement of eddies generates upwelling along the entire water column. Upwelling events increase the amount of nutrients and phytoplankton on the seamount . Another reason seamounts are so productive is a mechanism causing zooplankton to be trapped on the seamount during their vertical migration. Zooplankton rise to surface waters at night to feed, and some are moved by surface flows over the seamount. In the morning, after feeding, zooplankton make their descent down the water column. As they descend, they can get caught on the summit of the seamount and become prey to other fish . Unlike most areas of the deep-sea, seamounts are made of basalt due to their volcanic origins. Having such a hard surface provides a substrate for sessile organisms such as deep-sea corals and sponges . Corals make up the greatest percent of the total biomass on seamounts and their unique structures create the habitat for other invertebrates and many species of fish . Corals have slow growth rates, meaning that their habitat forming structures developed over a long period of time. Methods of deep-sea fishing mentioned later on can destroy deep-sea corals and the habitat they form . Between their high primary productivity due to phytoplankton blooms and lots of available zooplankton, seamounts are able to support a diverse range of consumers. Seamounts have benthic as well as pelagic organisms that make up a complex and biodiverse food web . The high productivity available at seamounts make it the most optimal place for people to fish in the deep-sea. Global distribution and sizes of major deep-sea fisheries. 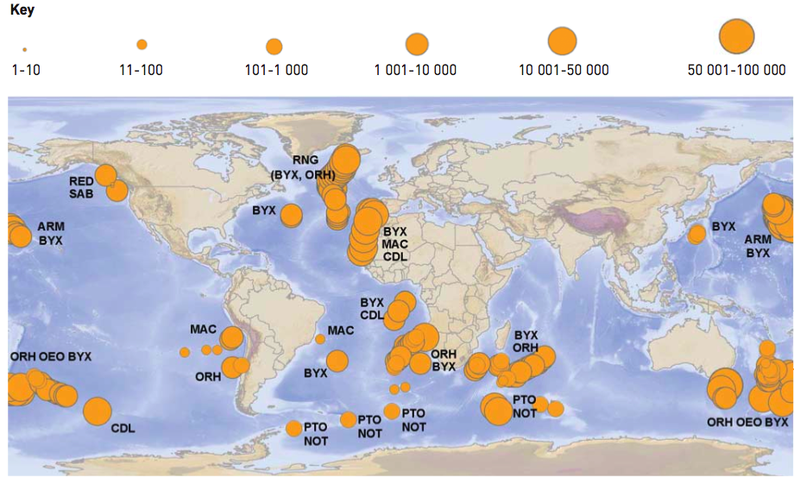 Global distribution of major historical deep-sea fisheries . Relative size of major historical deep-sea fisheries . The main method for fishing used by deep-sea fisheries is bottom trawling. Trawl nets are anywhere between 50 and 100 meters wide, and are heavy so that they can quickly sink to seamount ridges. Trawls have large, heavy doors, which keep the net open during the trawling. They also have steel disks called rockhoppers, which prevent the large net from tearing on rocks or coral. Rockhoppers may prevent tearing of the net, but they crush and kill many of the benthic creatures they run over . Seamounts are often geographically isolated from one another, meaning that there tends to be a lack of gene-flow between seamounts. Due to this lack of gene flow, seamount fish from different world regions have independently evolved many of the same characteristics for living on seamounts. These fish typically have a strong tail in order to move through the strong currents associated with seamounts . Many seamount fish have long life spans and late sexual maturity. Deep-sea fish have evolved these life cycle traits to cope with living in cold and dark environments. Depth and temperature directly affect growth rates, maturity, and maximum age of fish species . Many deep-sea fish species produce larger eggs, meaning lower fecundity because more parental investment goes into each egg. Having greater egg yolk reserves for developing larva is an adaptation for the lack of food available in the deep sea. These life cycle characteristics make deep-sea fish much more vulnerable to population declines than fish that live in shallower areas. When deep-sea fisheries target these species, they are not able to control the age of the fish that they take. This means that many of the juveniles that have not had the opportunity to reproduce are taken during trawling. Table 1: A modified list of exploited deep-sea fish . The furthest column on the right refers to the resilience of the species. The intrinsic vulnerability index is ranked from 1 to 100, with 1 being completely resilient, and 100 having no resilience. These numbers are determined from an equation that takes into account relationships between life history and ecological characteristics of a species . Knowing the vulnerability of exploited fish will help people make better management decisions in the future. 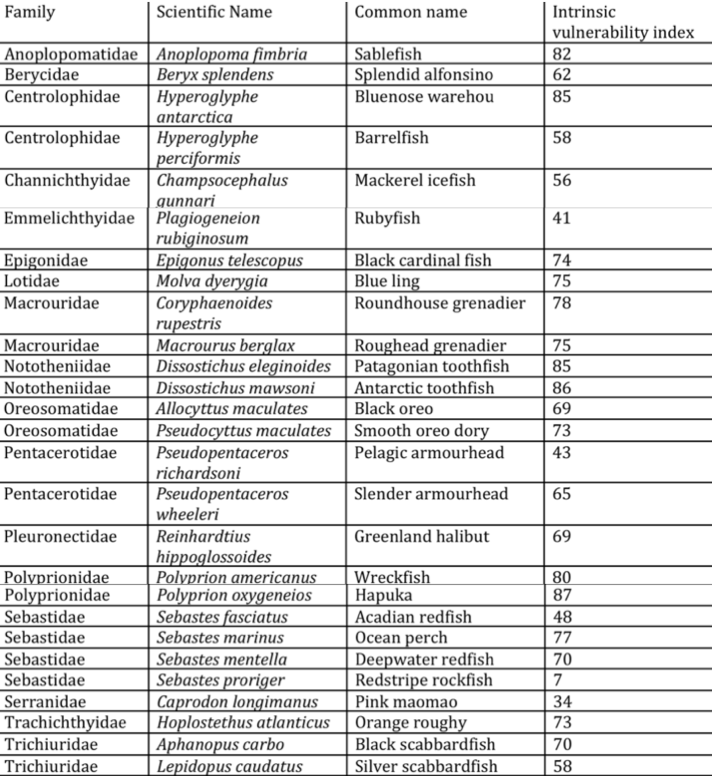 Table 2: A modified list the 6 commercial fish species that have the highest total historical catches from seamounts. 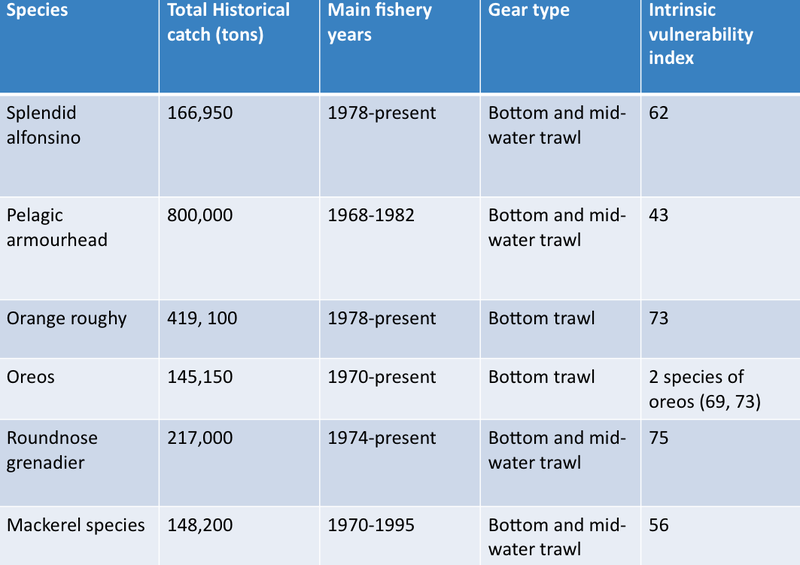 Shown are the main fishing years, and the type of gear used, as well as the intrinsic vulnerability index of each . The pelagic armourhead has the largest totat historical catch, but also is significantly more resilient to over-exploitation than many other seamount fish. The orange roughy has the second highest historical catch, but is also much more vulnerable. Due to its continued demand and commercial value, the orange roughy is a main focus for deep-seep fisheries . The orange roughy (Hoplostethus atlanticus) is one of the most highly marketable deep-sea fish, as well as well as one of the most exploited. The orange roughy has a life span of over 100 years, doesn't hit sexual maturity until it is 25, and aggregates in large numbers around seamounts during feeding and spawning. These characteristics make it very vulnerable to over-exploitation . The orange roughy is found at depths of 700-1500 meters off the coast of New Zealand. 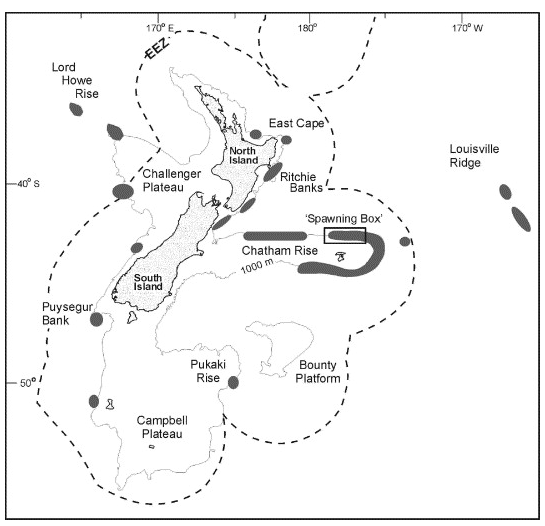 The New Zealand fishery developed on the Chatham Rise in 1979, and by the early 1990s had locations on the Challenger Plateau, Ritchie Banks, Puysegur Bank, and East Cape (see map below). The fishery took between 40,000-50,000 tonnes (t) per year through the 1980s, but decreased in the 1990s with reductions in the total allowable catch (TAC) because of declines in stocks due to overfishing . The early TACs were based on limited research on orange roughy biomass and as more research was done, it was realized that the orange roughy was less abundant than originally thought, and TACs were lowered . On its own, Chatham Rise had catch levels of 20,000 to 30,000 t per year throughout the 1980s. This stock of orange roughy had been extremely overfished and by the 1990s the TAC for Chatham Rise decreased from 33,000 t (1990) to 7,000 t (1996). The virgin biomass for orange roughies off the northeastern part of Chatham Rise was estimated at 300,000 t, but had been fished down to about 50,000 t in 1998, which is 15-20% of virgin levels . Since 1984, there has been an active research program based on trawl surveys, which provides data on the abundance of the orange roughy. Since the beginning of the survey through 1994 there has been a decline in the relative abundance of the orange roughy over Chatham Rise and Challenger Plateau. Chatham Rise was fished down to 20% of virgin levels, but has maintained a fairly stable fishery nonetheless. The smaller orange roughy stocks were more affected by overfishing than Chatham Rise or Challenger Plateau. On Puysegur Bank the orange roughy was fished down to 20% of virgin stocks and it is not certain whether or not they will be able to rebuild. The TAC at Puysegur Bank in 1991 was 5000 t and by 1997 it was zero . The larger stocks (Chatham Rise and Challenger Plateau) have shown some rebound due to research programs that much better regulate fishing quotas in these areas. Small stocks like the one in Puysegur Bank have not faired as well, and it is unsure how long it will take for orange roughy stocks to rebuild . The New Zealand region, showing the location of main fishing grounds for the orange roughy . Predicted large seamounts with depths between 750 and 1,200 meters, the main depth range for orange roughy fisheries . The life history characteristics of deep-sea fish make them highly vulnerable to over-exploitation. Examples from fisheries all over the world have shown a pattern of "boom and bust" fishing. Aggregating fish (orange roughy, alfonsinos, Patagonian tothfish, oreos, pelagic armourhead, and rockfish) are especially vulnerable to over-exploitation because they are easy targets for trawl nets because they swim in groups on top of seamounts . When a seamount is first fished, these species are highly abundant, and fisheries can quickly make money off of their catch. However, these fish stocks are not resilient to population declines, and within about ten years of the fishery's initial development, populations will not recover, and the fishery will "bust." This "boom and bust" pattern has been attributed to the longevity of many deep-sea fish, their tendency to aggregate, and largely due to the lack of deep-sea fishing management . Deep-sea fishing is relatively new in our world's fishing history. There is still a lot that we don't know about the ecology and life history interactions of deep-sea fish. In order to manage for sustainable fishing, it is vital to know the relationships of deep-sea fish and their habitats. Recruitment of fish populations is assumed to be a function of stock size, and that when the population is in a state of equilibrium, natural mortality is balanced by new recruits. This model is applicable for most fish populations, however, there is evidence that deep-sea fish have much more variance in their recruitment. Fishing under a constant quota for fish that have episodic recruitment is not sustainable, and is much more likely to lead to stock collapse . The methods of deep-sea fishing are also not sustainable. The use of bottom trawling kills corals and other benthic invertebrates. Corals are a necessary component of seamount ecosystems because they make up the habitat for other species. By removing corals, fisheries are indirectly contributing to the decline of the fish that they are targeting . Many seamounts are located outside of EEZs (exclusive economic zone). EEZs mean that countries have out to 200 miles off of their coasts to fish for themselves. Creating a moratorium on deep-sea fisheries on the high seas would be appropriate because it would stop a few countries from harming the biodiversity of the entire ocean . As you can see, deep-sea fishing is not sustainable. Some of the main factors for determining sustainability, such as life span and time of reproductive age, are not taken into consideration when fishing these species. Using trawl gear that brings up coral as by-catch takes away the habitat for targeted fish, further contributing to the collapse of deep-sea fish species. Everyone can make a difference when it comes to preserving these habitats and fish species. When you go food shopping, look for sustainable seafood certifications. When you go out to eat, ask where and how the fish was caught. Pocket Guide to Seafood: A useful guide for knowing what fish you should buy, and what you shouldn't. Sea Around Us: Find more information about fisheries, ecosystems, and biodiversity. Koslow, T. 2007. The silent deep: the discovery, ecology, and conservation of the deep sea. The silent deep: the discovery, ecology, and conservation of the deep sea.:1-270. Norse, E., S. Brooke, W. Cheung, M. Clark, I. Ekeland, R. Froese, K. Gjerde, R. Haedrich, S. Heppell, T. Morato, L. Morgan, D. Pauly, R. Sumaila, and R. Watson. 2012. Sustainability of deep-sea fisheries. Pages 207-320 Marine Policy. Elsevier. Clark, MR, Tittensor D, Roger AD, Brewin P, Schlacher T, Rowden A, Stocks K, Consalvey M. 2006. Seamounts, deep-sea corals and fisheries: Vulnerability of deep-sea corals to fishing on seamounts beyond areas of national jurisdiction. UNEP World Conservation Monitoring Centre 1-80. Clark, MR, Rowden AA, Schlacher T, Williams A, Consalvey M, Stocks K, Rogers AD, O’Hara TD, White M, Shank TM, Spencer JM. 2010. The ecology of seamounts: structure, function, and human impacts. Annual Review of Marine Science 2: 253-278. Gordon, JDM. 2001. Open ocean fisheries for deep-water species. Scottish Association for Marine Science. Hilborn, R, Annala J, Holland DS. 2006. The cost of overfishing and management strategies for new fisheries on slow-growing fish: orange roughy (Hoplostethus atlanticus) in New Zealand. Canadian Journal of Fisheries and Aquatic Sciences 63: 2149-2153. Morato, T, Clark MR. "Seamount Fishes: Ecology and Life Histories. "Seamounts: Ecology, Fisheries & Conservation. By Pitcher, TJ. Oxford: Blackwell, 2007. 170-88. Print.